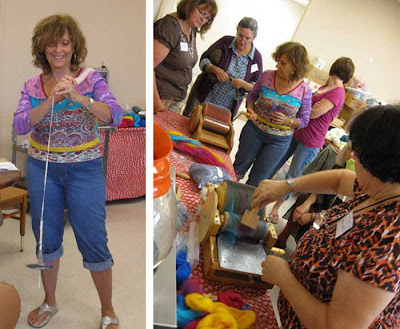 What a blast we had at the September Riverbend Fiber Arts Guild meeting. One of the teams presented a program on Spinning with a Drop Spindle and carding art batts to make art yarns. 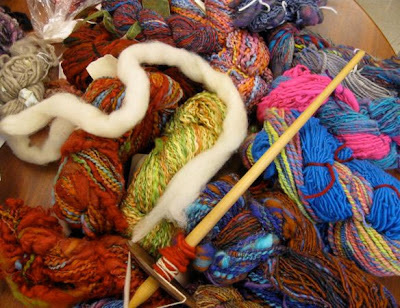 Take a look at these beautiful yarns spun by some of the guild members. They're almost too sumptuous to knit. A bottom whorl drop spindle and various art yarns. Learning to spin with a drop spindle was lots of fun... but it's not as easy as it looks. Can you say, "rub your tummy and pat your head?" (Better yet, can you do it?) The program team assembled bottom whorl drop spindles from wooden dowels, a cup hook and a CD so that non-spinners could try their hands at spinning. The spindles were surprisingly well-balanced and durable—they don't call them "drop" spindles for nothing! Left: Spinning with a drop spindle. Right: Carding and combining roving for art batts. 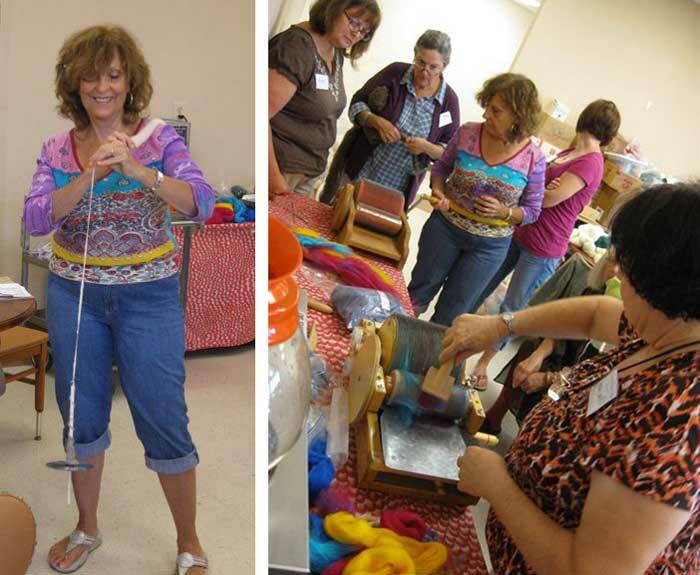 The second half of the program was a demonstration on using the drum carder to make art batts. The art yarns spun from these batts are eclectic mixes of fibers, textures, colors and even embellishments combined in a single yarn. There are infinite possibilities here.